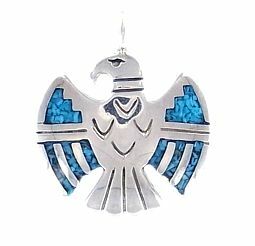 In Native American lore the Thunderbird is the second most powerful guardian spirit after lightning. Indeed the ancient tribes believed that storms were created by an enormous bird that caused thunder when it flapped its wings and lightning by opening and closing its eyes. The Thunderbird was a clan ancestor and guardian spirit bringing success in war and long life. He is also the sacred bearer of unlimited happiness. Sterling Silver with turquoise inlay. 2.5cm x 2.5cm (1" x 1") On 18" Sterling Silver Snake Chain.